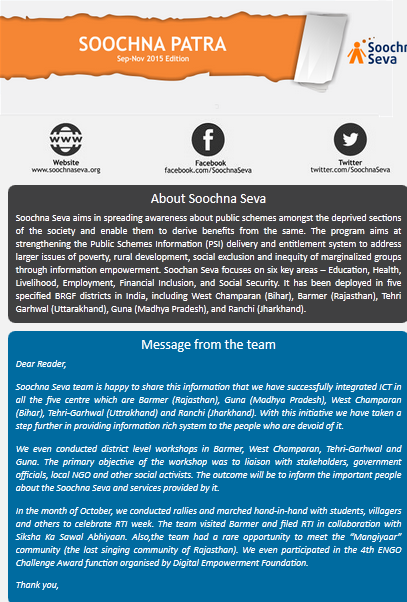 Soochna Seva team is happy to share this information that we have successfully integrated ICT in all the five centre which are Barmer (Rajasthan), Guna (Madhya Pradesh), West Champaran (Bihar), Tehri-Garhwal (Uttrakhand) and Ranchi (Jharkhand). With this initiative we have taken a step further in providing information rich system to the people who are devoid of it. Soochna Seva aims in spreading awareness about public schemes amongst the deprived sections of the society and enable them to derive benefits from the same. The program aims at strengthening the Public Schemes Information (PSI) delivery and entitlement system to address larger issues of poverty, rural development, social exclusion and inequity of marginalized groups through information empowerment. Soochan Seva focuses on six key areas – Education, Health, Livelihood, Employment, Financial Inclusion, and Social Security. 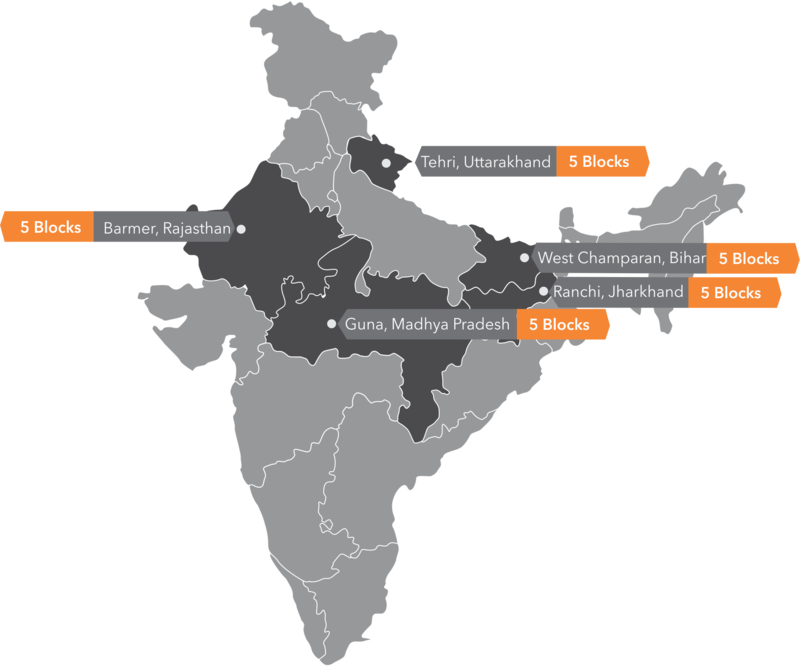 It has been deployed in five specified BRGF districts in India, including West Champaran (Bihar), Barmer (Rajasthan), Tehri Garhwal (Uttarakhand), Guna (Madhya Pradesh), and Ranchi (Jharkhand). 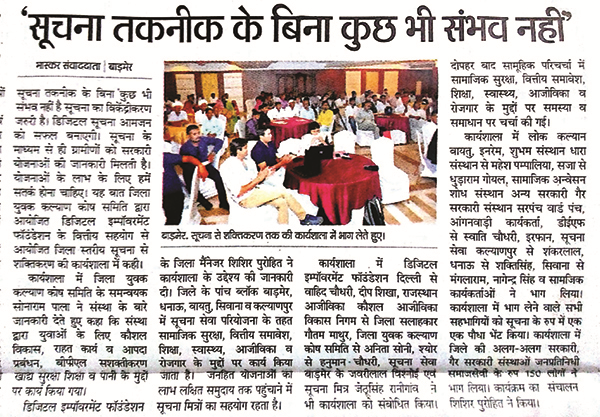 We even conducted district level workshops in Barmer, West Champaran, Tehri-Garhwal and Guna. The primary objective of the workshop was to liaison with stakeholders, government officials, local NGO and other social activists. The outcome will be to inform the important people about the Soochna Seva and services provided by it. In the month of October, we conducted rallies and marched hand-in-hand with students, villagers and others to celebrate RTI week. The team visited Barmer and filed RTI in collaboration with Siksha Ka Sawal Abhiyaan. Also,the team had a rare opportunity to meet the “Mangiyaar” community (the lost singing community of Rajasthan). We even participated in the 4th ENGO Challenge Award function organised by Digital Empowerment Foundation. Antro Devi (55) is a resident of Segri village in Rani Gaon panchayat, Barmer district. Within two months of marriage, her husband passed away and since then her life did not go smoothly. Soochna Seva team intervened into her matter and helped her get the widow pension. Bhagni Devi was devoid of any personal identification documents such as her husband’s death certificate, voter card, residential proof, Aadhar card, etc. and due to this she was unable to apply for any government scheme. Soochna Seva team intervened and assisted her to get benefits under Parivarik Labh Yojana. In Dehari Kalan village of Aron block, the team found faulty hand-pump. They complained to the PHE department but at all levels their request was not noticed. But, when the matter went to the District Level department, the PHE department took immediate action and repaired the hand pump in no time. Soochna Seva team collaborated with veterinary doctors and conducted a vaccination camp in the village that too free of cost. Jhono Kerketta and many other villagers brought their cattle in the camp and returned with a vow to vaccinate their cattle within six months of time. Ram Singh had the perception that he would never require a bank account. His misconceptions were clarified by one of the Soochna Seva team members. The team collected all the documents from Ram Singh and deposited them in the bank and helped him open an account.